Join The Army Air Service. Be An American Eagle! Poster with an illustration of an American eagle battling a Prussian eagle. Behind them, airplanes are flying towards an explosion. 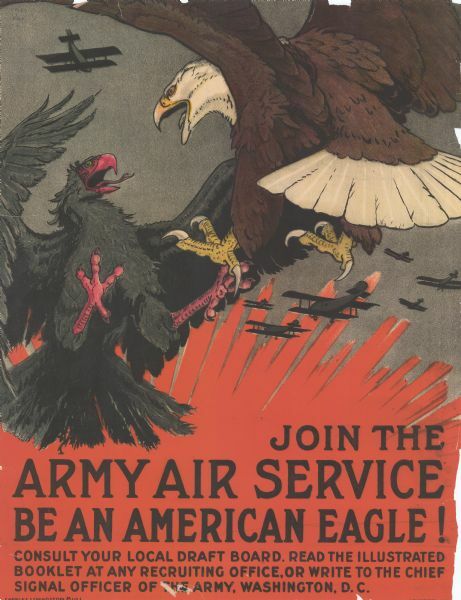 Poster text reads: "Join the Army Air Service. Be an American Eagle! Consult your local draft board. Read the illustrated booklet at any recruiting office, or write to the Chief Signal Officer of the Army, Washington, D.C."
Illustration signed by Charles Livingston Bull on bottom left. Text at bottom right reads: "Alpha Litho Co. Inc., N.Y."